The single largest global environmental challenge today is climate change. Buildings are contributing to this issue, being responsible for approximately one third of the world’s greenhouse gases. However, going forward they could also be part of the solution. We specialise in designing high performance, energy- and resource-efficient buildings, tailored to client objectives and to the needs and well-being of occupants, with a special focus on minimising their environmental and ecological impact. Our team is able to design new buildings and the renovation of existing buildings. At new buildings, we hold design meetings, perform building’s energy simulation, recommend areas that can be optimised, such as the type of air conditioning system, type of lamps, window to wall ratio, type of glazing and building’s orientation. We guide energy efficiency decisions and manage green building certifications. At existing buildings, it’s a case of carrying out energy audits and retro-commissioning in order to recommend improvements and show cost benefits so business owners can make decisions that benefit them. Our holistic approach to green building design takes into account the whole life cycle of the building, from the earliest stages of design through construction and operation to demolition. We advise on orientation, building’s material, lighting system, air conditioning system, glazing size and types to optimize natural resources and incorporate renewables where possible. Working collaboratively with the architect during the early stages of design, we seek to maximize the inherent potential for passive environmental regulation. We can often improve building performance without increasing cost through the application of natural ventilation, passive solar heating, daylight harvesting and thermal mass cooling. Utilizing advanced computer simulation programs to analyse the overall and the detailed energy performance as early in the design process as possible through design workshops with all the other consultants in the project. That allows strategic decisions to be taken, such as extra investments to be made in a more energy efficient facade that will be balanced by savings to be made on a reduced size of the ventilation and cooling system, a reduction that can be determined early on in the design process using computer modelling. If optimization processes are applied sequentially, the optimal and economical design will not be achieved. It is necessary to implement integrated energy design development where both the active (mechanical and electrical systems) and the passive design features (architectural design: orientation, façade design, wall construction, construction materials etc.) are evaluated and optimized in one process, where the objective is to balance active and passive features so that the best energy performance is achieved at the lowest overall investment costs. When Holistic Design Optimization is implemented a typical building costs less than 5% extra, and it is a least 5% more valuable. Furthermore the payback time from operational savings is 5 years or less. 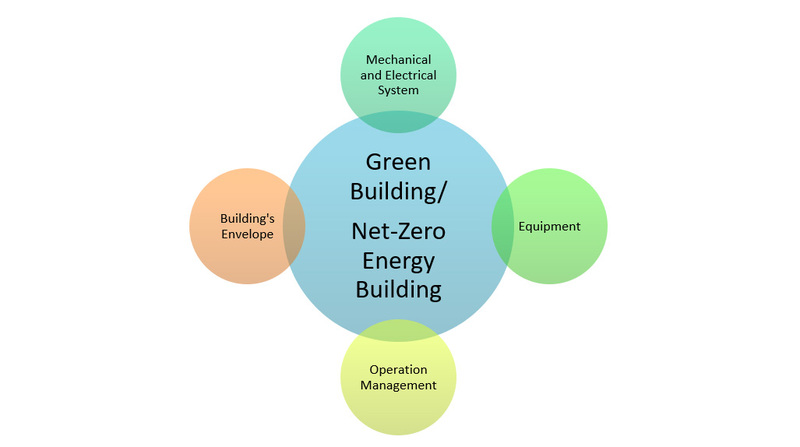 There are no real extra costs for green buildings, only savings! Our work also involves tracking a building’s post-occupancy energy, water, and thermal comfort performance against our predictive models, highlighting discrepancies, recommending corrective actions and overseeing their implementation.